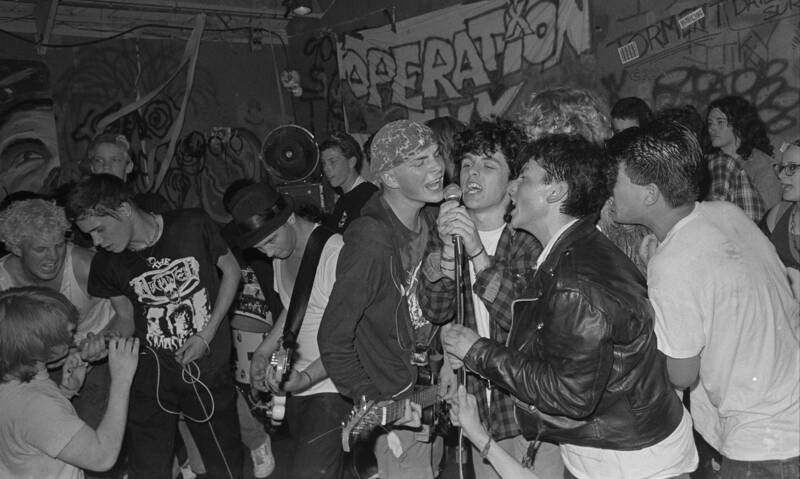 When I think of the new documentary Turn It Around: The Story of East Bay Punk, I think about a teenager named Jimmy Mahoney, who last year was called up on stage by Billie Joe Armstrong from Green Day for a dream opportunity: to play guitar with his favorite band in front of thousands of people. The band routinely does this for a lucky fan every night on tour, but on this night at the Oracle Arena, after Caleb’s guest turn, Billie Joe unexpectedly gave Mahoney his guitar, covered in stickers from early-’90s East Bay punk bands like Monsula, Econochrist and Spitboy. You have to wonder: was the guitar intentionally decorated with names of other East Bay bands in order to provide its recipient with musical clues in a treasure hunt? And did Jimmy bring the guitar home and Google them, to discover the influence they had on his teenage heroes? Turn It Around, a 158-minute documentary produced by members of Green Day which opens May 31, is that same idea in extended cinematic form. Released during Green Day’s current world tour of sold-out arenas, it’s their way of telling the world: We didn’t do this alone. The East Bay is special. Here’s where we came from.